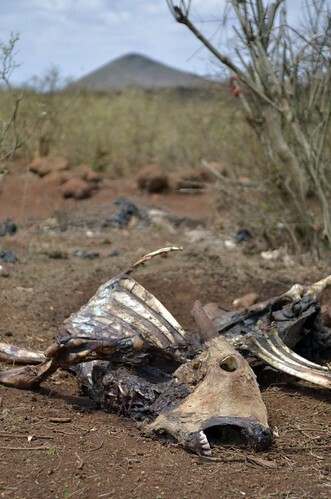 A massive die-off of livestock across the great pastoral drylands of the Horn of Africa in 2011 threatened the livelihoods of more than 13 million people, most of them in Somalia, Ethiopia and Kenya, and killed tens of thousands of the most famished and vulnerable people. This—what is believed to have been the worst drought in the region in six decades—combined with civil strife in Somalia has generated nearly 100,000 refugees and sent untold numbers of people into absolute—and, for many, everlasting—poverty (photo of cow carcass in northern Kenya, credit: Neil Palmer/CIAT). With the news cycle generated by the United Nations Conference of the Parties (CoP 17) climate change conference in Durban in Dec 2011 now over and the rains having arrived in central and southern Somalia, easing both the drought and the famine there, it appears to be an appropriate time to revisit the underlying causes of the hunger and famine that swept across these lands in the second half of 2011. This was the first famine to be declared in the Horn by the United Nations in nearly 30 years. In a 34-page policy paper published recently (18 Jan 2012), Oxfam and Save the Children estimate that between 50,000 and 100,000 people died between April and August 2011, more than half of them children under five. The following opinion piece by Jimmy Smith, director general of the International Livestock Research Institute (ILRI), explores what it will take to prevent such a tragedy from happening again in this region. The ongoing famine in southern Somalia, and the hunger elsewhere in the Horn of Africa, is a catastrophe that has been hard to look at and hard, for most of us in our wired and networked 21st century, even to absorb. But face it we must. None of us hearing the horror stories of tens of thousands of refugees fleeing villages broken by several years of crippling drought, which turned lands and livestock alike to dust, and then, with the arrival of seasonal rains, to mud, can fail to be aware of our own part in this still-unfolding tragedy. For we together have failed to provide the livestock herders and crop farmers who inhabit these marginal lands with even the minimal resources they need to keep their environments productive. In the opinion of some, our alternating neglect and wholesaling of East Africa’s vast and once productive dryland ecosystems has helped turn them into fragmented wastelands, dotted with refugee camps. We may tell ourselves that there is little we can do about political strife in countries such as Somalia, but we cannot say the same thing about our perennial under-investment in small-scale rain-fed food production, an activity that remains the over-riding business of virtually every person living in the Horn today. Rich and poor nations alike have systematically failed to deliver this support, support that is usually promised in our meetings, support that is needed to build and sustain Africa’s own food production capacities. What Africa’s rural farming and herding communities have needed, above all else, is increased agricultural research and development, with concomitant investments in rural roads, power, irrigation, clinics and schools. By failing to maintain sufficient levels of scientific as well as financial resources, we have failed to help local communities take up and adapt more sustainable and profitable herding and cropping practices. The desiccation that devastated the Horn’s dry rangelands last year has parallels with that which occurred in the semi-arid grasslands of North America’s heartland some 70 years ago, creating a vast Dust Bowl across 19 states. The immense dust storms that blew the topsoil off the Great Plains throughout the 1930s made millions of acres of land useless and forced hundreds of thousands of people to leave their homes for other regions. Some people died of malnourishment, hundreds of thousands of people entered years of penury and joblessness, and by 1940 a total of some 2.5 million people had been dislocated and forced to migrate, like nearly 100,000 mostly Somali people in the Horn today. In the wake of the American disaster, and in spite of a Great Depression then crippling the country—a financial crisis even deeper than that we’re facing today—a critical mass of agricultural expertise and ideas was brought to bear on those issues underlying the crisis. That mattered because the Dust Bowl was caused primarily not by several years of drought but rather by several decades of unsustainable farming, by a ‘carelessness of plenty’, with American entrepreneurs encouraged, by the availability of big farm machinery and easy credit as well as a period of unusually wet seasons, to plough the prairie sod to excess, as well as to overgraze it, which destroyed the prairie grasses and laid the land bare. Americans set about transforming this by investing heavily in better farming. The federal government, for example, began an aggressive campaign to teach farmers soil conservation methods, and actually paid farmers to practice these methods. It set up a Drought Relief Service that bought cattle in emergency areas at better-than-market prices and then used the cattle for food distributed to hungry people nationwide. And it advised families remaining in the prairie states to shift from crop and wheat production to livestock and hay production, a more appropriate use of degraded lands. Finally, and critically, America’s network of land-grant universities was mobilized not only to help feed people in the emergency but also to find lasting solutions for rebuilding the productivity and resilience of the nation’s prairies. The idea was to bring the scientific knowledge of land-grant colleges to American farmers. The idea worked. Today, international, regional and national research and development groups, working together in well-coordinated ways and tied to local conditions and priorities, have an opportunity to make a similar difference in the Horn, helping its homeless and hungry people to reclaim their lands and livelihoods. It is, therefore, gratifying to see the donor community and governments mobilizing financial and technical resources to respond to the lessons just learnt in the Horn. We’ve seen that unsustainable prairie cropping in North America and unsupported livestock-based agricultural production systems in the Horn, when combined with lengthy and severe drought cycles, are toxic mixes. But if America’s earlier tragedy teaches us anything, it’s that we can turn defeat into new destiny by applying the best of science—smart, innovative and conservation-minded agricultural research—and promoting those agricultural practices that will make the biggest and most enduring difference to poor people and their environments. Americans said ‘never again’ about the Dust Bowl—and they made good on their promise. We can, and should, say the same thing about hunger and starvation in the Horn of Africa. (1) The Guardian‘s Global Development Blog started the new year with a chat discussion on the food crisis in the Horn of Africa, where famine was officially declared on 20 Jul 2011. As the Guardian‘s Jaz Cummins reports, on 13 Dec 2011, the UN made an appeal for USD1.5 billion to support projects in Somalia in 2012—a figure 50% higher than in 2011. (2) Is A Food Crisis Brewing in the Sahel? A meeting to be held on 25 Jan 2012 in Washington, DC, will assess whether a similar food crisis is brewing in the Sahel—and the best ways of ensuring that resources to deal with it are not squandered in ‘band-aid treatments’ but rather used to build resiliency in the region. The meeting is being organized by The Partnership to Cut Hunger and Poverty in Africa and the Woodrow Wilson International Center for Scholars Africa Program, in collaboration with the United States Agency for International Development (USAID) and the Famine Early Warning System Network (FEWS NET). While African nations and the donor community struggle to mitigate famine in the Horn of Africa, fears are growing that drought in the Sahel will trigger a similar food crisis in West Africa by the spring of 2012. However, experts have cautioned against misdiagnosing the food situation in the Sahel, for fear that excessive band-aid treatments of emergency food assistance will squander energy and scarce resources that would be better utilized in treating pockets of severe food insecurity and building resiliency in the region. With input from US and African experts on the Sahel, this event will explore the true nature of the emerging crisis in the Sahel and seek to identify effective responses, including regional trade and resilience-building through agricultural development. Ann Waters-Bayer, a pastoral expert and senior advisor at ETC EcoCulture, was a panel member at a seminar put on for European Development Days 2011, 15–16 Dec 2011, in Warsaw. The panelists, comprising practitioners and policymakers, discussed how to prevent another crisis of this scale and the role that the EU can play in reaching long-lasting sustainable solutions. Speaking on the panel, Waters-Bayer reminded her audience that pastoral modes of production are often the most appropriate uses of these and other of the world’s great drylands. ‘We’re ten years late in trying to support development which is appropriate to the Horn of Africa and other dryland ares. I think a lot of people in Europe don’t realize what are the most appropriate food production systems in the very dry and variable areas. Often the kinds of development support provided in these drylands are those more appropriate to Europe or better-watered areas. ‘I found it striking that in the film we’ve seen on how to prevent famine from happening again in the Horn of Africa, pastoralism was not mentioned. Pastoralism is the production system practiced in the largest part of the Horn of Africa. Pastoralism is the production system most appropriate for this type of environment. Pastoralism takes advantage of what crop farmers would regard as a constraint, a challenge, a problem—this variation in availability of vegetation, caused by the variability of rain, of water. Pastoralists take advantage of this variability by moving with their animal herds. One of the big problems in this dryland region has been that a lot of the development and a lot of the policies for this region, especially policies dealing with use of communal resources and acquisition of so-called ‘unused land’, are policies confining pastoralists and making it impossible for this very appropriate production system to continue to operate. ‘Land grabbing has really become a big issue in the Horn of Africa and other parts of Africa. Land grabbing, or land acquisition, supposedly for more productive uses of the land, is going on without people realizing what production systems are actually using that land and how productive those systems are. ILRI director general Jimmy Smith speaks to residents of Marsabit, in northern Kenya, where a livestock insurance scheme has made its first payouts to small livestock keepers following a prolonged drought in the Horn of Africa (photo credit: Neil Palmer/CIAT). 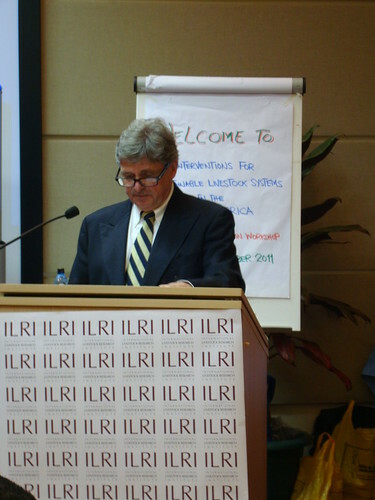 Jimmy Smith, director general of the International Livestock Research Institute, made the following remarks on the occasion of the first payouts of index-based livestock insurance policies ever made to livestock herders in Africa in a region that has been afflicted by the drought that has reduced herds in the drylands of the Horn by a third. Inhabitants of Marsabit town, in northern Kenya, attend a special event marking the first payouts of a livestock insurance scheme to small-scale livestock keepers following a prolonged drought in the Horn of Africa (photo credit: Neil Palmer/CIAT). ‘Today ILRI’s Index-Based Livestock Insurance (IBLI) project provides 650 livestock herders in Kenya’s remote Marsabit District with the very first payments of index-based livestock insurance claims ever made on this continent. ‘That makes this an important as well as historic moment. 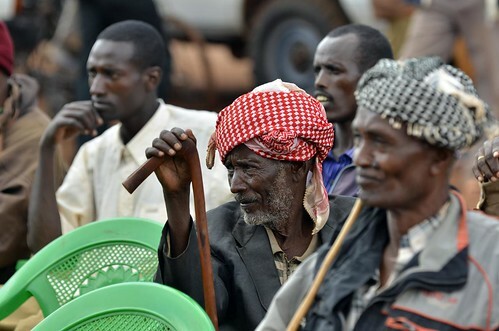 Members of the Marsabit community listen to speakers at the launch of the first payouts of livestock insurance in Africa (photo credit: Neil Palmer/CIAT). ‘The success of any insurance scheme depends on its clients being confident that payments will be made if and when an insured event occurs. I hear that many have been reluctant to purchase the livestock insurance policies being offered to Marsabit’s livestock keepers in August and September of this year  because the herders first wanted to be assured that this insurance product works and—in this time of great drought and livestock losses here and elsewhere in the Horn of Africa—if it will payout. Now that the appropriate payments are being made and in a timely manner, we hope we have earned the trust of people here, trust that will generate more widespread awareness and interest in this livestock insurance product. Women of the Marsabit community listen to speakers at the launch of the first payouts of livestock insurance in Africa (photo credit: Neil Palmer/CIAT). ‘We are celebrating today not only the first payouts but also that the livestock index that predicts mortality in this region seems to be working well; several of our on-the-ground partners in Marsabit are in agreement with the figures. Our relatively inexpensive way of estimating livestock deaths in a time of drought and forage loss appears to be reliable and could now open the door to making livestock insurance widely available in Marsabit and similar areas in Kenya’s northern drylands, which are home to many of its pastoral peoples. 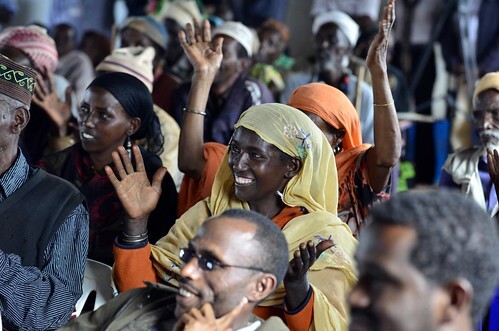 At a village meeting in Dirib Gombo, farmers who took out livestock insurance hear they are to receive their first payout after a prolonged drought in the region (photo credit: Neil Palmer/CIAT). ‘For all its initial success, this insurance project remains a work in progress. We’re aware of the challenges of raising awareness of the program in the more distant areas of Marsabit and making sales across the entire district. And even as we trust that those who purchased this livestock insurance will receive their payments in the shortest time possible, we recognize that many clients will have to be paid manually, a process that involves costly driving to areas as far as Loiyangalani and Illeret, where some pastoralists also bought contracts. That said, over the last three insurance sales periods since January 2010, Equity Bank’s Point of Sale systems and UAP’s telephone scanners have made the process more efficient. Over the next several seasons, on-going efforts will continue to improve the technology platforms delivering IBLI services, making them increasingly more cost-effective and accessible. At a village meeting in Dirib Gombo, officials prepare to make the first insurance payouts after a prolonged drought in the region (photo credit: Neil Palmer/CIAT). ‘The most important sign of success is the response of the client. So even as payments are being made, we at ILRI want to know what impact the payments are having and how valuable the insurance product is. You will see the ILRI team in this area conducting research to understand how IBLI is benefiting the community and those households that bought livestock insurance. We worked with members of the community to design and develop this product, and we are keen to receive your suggestions about ways to improve it. At a village meeting in Dirib Gombo, farmers who took out livestock insurance receive their first payout after a prolonged drought in the region (photo credit: Neil Palmer/CIAT). ‘‘A project such as this is necessarily a product of collaboration. ILRI and our commercial partners Equity Bank and UAP Insurance—those who actually market and sell the product—are quite visible, but there are several others that must be recognized. Cornell University and the Index Insurance Innovation Initiative (I4) based out of the University of California at Davis have been instrumental in the development of the IBLI product and supporting the research agenda behind it. Closer to the ground, members of the Marsabit District Steering Group have offered invaluable support and advice to the project team, as has Food for the Hungry International. The project has also received tremendous support from the Ministry of the Development of Northern Kenya and the Ministry of Livestock and the Provincial Administration, from the District Commissioner to chiefs and counsellors across Marsabit. 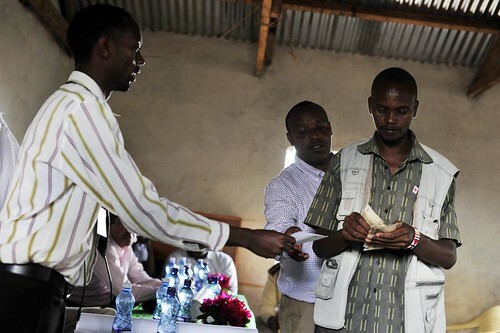 Finally there are the hundreds of young men and women across all divisions of Marsabit who have worked tirelessly conducting surveys and product education and extension. Leader of the Index-Based Livestock Insurance Project, ILRI’s Andrew Mude (right), answers a questions from the Marsabit community (photo credit: Neil Palmer/CIAT). A farmer awaits a livestock insurance payout following a village meeting in Dirib Gombo, near the northern Kenyan town of Marsabit; some farmers in the village took out livestock insurance, and this year are receiving the first payouts after a prolonged drought in the region (photo credit: Neil Palmer/CIAT). One of the many head of cattle that perished for lack of fodder in the drought that dried up the rangelands of Kenya’s Marsabit District this year (photo credit: Neil Palmer/CIAT). Editor’s note, 26 Oct 2011: The original title of this blog post, ‘Livestock director and partners launch first-ever livestock insurance payments in Africa,’ was changed to ‘Livestock director and partners launch first-ever index-based livestock insurance payments in Africa;’ other forms of livestock insurance (not index-based) have been available in other parts of Africa. Two similar statements in the body of the blog were similarly corrected. 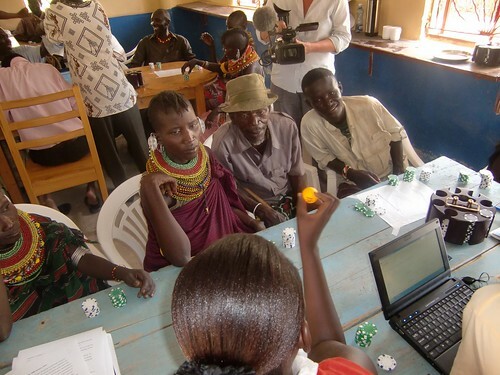 Pastoralists from Marsabit, in Kenya’s remote northern drylands, play a game crafted by ILRI scientists to simulate livestock losses that could occur due to drought, in which the local herding communities are educated about how index-based livestock insurance works (image credit: ILRI). As livestock deaths mount, a small group of herders in Kenya’s Marsabit District is first to benefit from program that tracks forage conditions via satellite. In the midst of a drought-induced food crisis affecting millions in the Horn of Africa, an innovative insurance program for poor livestock keepers is making its first payouts today, providing compensation for some 650 insured herders in northern Kenya’s vast Marsabit District who have lost up to a third of their animals. Known as index-based livestock insurance, or IBLI, payouts are triggered when satellite images show that grazing lands in the region have deteriorated to the point that herders are expected to be losing more than 15% of their herd. The current readings for which indemnities are now being paid show that between 18 and 33% of livestock have been lost to drought this season. ‘It’s terrible that we are seeing this level of loss, but gratifying that the policies are doing what they are supposed to do, which is to help herders avert disaster when weather conditions dry up pasture lands and animals begin to perish,’ said Isaac Magina, head of agriculture insurance at UAP Insurance Ltd.
‘When you look at a 33% loss, that is a significant portion of the asset base of any business and it would be difficult to survive without insurance,’ added Magina. The Marsabit District alone is home to some 86 thousand cattle and 2 million goats and sheep that generate millions of dollars in milk and other products and serve as the main source of sustenance and income. ILRI estimates that up to one-third of all livestock in the region have perished during the current drought. In East Africa, an estimated 70 million people live in the drylands, and many of them are herders. In Kenya, the value of the pastoral livestock sector is estimated to be worth USD800 million. And the Intergovernmental Authority on Development in Eastern Africa, which takes a regional approach to combating drought in six countries of the Horn, estimates that over 90% of the meat consumed in East Africa comes from pastoral herds. Under the terms of the policy, insured herders are compensated for any losses above 15%, with the 15% threshold acting as a sort of deductible. For example, a cattle herder who lives in an area with a livestock mortality rate of 33% receives a payout covering 18% of his or her animals. With cattle valued at about 15,000 Kenyan shillings (Ksh) per head (about USD150), an insurance policy covering 10 animals, or Kshs150,000 in cattle, would pay out at about Kshs27,000 (about USD270). When the 15% deductible is factored in, compensation ranges from 3% in areas where the drought has been more moderate to 18% in the areas where herders were hit particularly hard. But in an indication of the severity of the drought, all of the areas where the policies were sold have exceeded the 15%mortality threshold that triggers a payout. Thus far, the policies cover about 1,100 animals—mostly cattle, but some goats and sheep and a few camels as well. 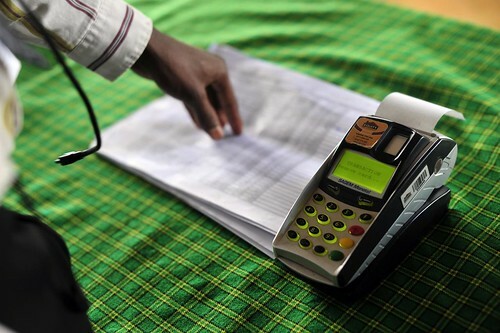 The payments are being dispatched in the middle of a humanitarian crisis endangering 12 million people in the Horn that is prompting a call for new ways to manage food security risks in East Africa’s arid drylands. For example, a recent report from ILRI has found that the pastoral approach to livestock production, in which herders make do with marginal lands by regularly moving their herds, could be very effective at averting weather-related food shortages. ILRI experts say that in arid and semi-arid regions, keeping livestock can be a more effective coping strategy than cultivating crops—if herders have options for reducing their vulnerability to drought. Mude said that it is too early to tell just how the payouts from the policies will affect food security and other welfare indicators. For example, it’s not yet clear how many herders will use the compensation to replace animals lost to the drought. But Mude said one major success thus far is that the livestock mortality index that is at the heart of the program appears to be working. The fatality rate predicted by the satellite assessments of forage loss is tracking very closely surveys of animal deaths on the ground. That’s crucial because using freely available satellite images of pasture lands to accurately predict animal deaths overcomes a major barrier that has bedeviled past efforts to provide livestock insurance in poor regions: the prohibitively high costs and logistics of confirming animal deaths in herds that roam across vast distances in extremely remote areas. Going forward, experts believe a key issue will be whether livestock insurance in East Africa would be commercially viable by itself or whether its ability to protect herders from the impact of prolonged drought might justify some level of financial support from governments or donors, as agricultural insurance programs in Western countries often do. ‘This insurance scheme is a great example of how partnerships with the private sector can lift people out of poverty and provide long-term solutions to food crises,’ said Andrew Mitchell, the British international development secretary. Ethiopian pastoralists of Somali origin have been trying to sustain their livestock livelihoods after some of their land was used to build a camp for Somali refugees at Dolo Ado, Ethiopia (photo on Flickr by Petterik Wiggers/Hollandse Hoogte—Photostream Giro 555 SHO). The Africa Union’s Interafrican Bureau for Animal Resources (AU-IBAR) recently convened a two-day consultation of experts working to address the challenges to development of the arid and semi-arid lands of the Horn of Africa. This expert consultation on ‘Interventions for sustainable livestock systems in the Horn of Africa,’ was held 2–3 Sep 2011 at the International Livestock Research Institute’s headquarters, in Nairobi, Kenya. The AU meeting was preceded by a news briefing and learning event convened by the CGIAR Consortium of International Agricultural Research Centers. CGIAR CEO Lloyd Le Page participated in both the Consortium and AU drought-related meetings. Both meetings helped to identify opportunities for sustaining food production in this sub-region, which continues to suffer from the catastrophic impacts of a severe drought, and helped to develop an initial framework for making better use of those agricultural opportunities in future. The more than 40 experts gathered at the AU meeting developed a joint statement to better inform long-term development of this region’s drylands. This statement, which follows in full, will be used at upcoming high-level meetings on topics related to food security. The current food security crisis in the Greater Horn of Africa is a stark reminder that insufficient attention has been given to addressing the root causes of vulnerability in the arid and semi-arid lands (ASALs) of this region. It is also apparent that it is not drought but rather vulnerability during drought in the ASALs that has thrown the region into repeated food crises. Yet in contrast to this vulnerability is the fact that the ASALs produce most of the livestock traded in the region, contributing up to 50% of agricultural GDP to the national economies, in addition to playing wider economic roles. African leaders at the country, regional and continental levels, along with global leaders and the development community, are now confronted with, and attempting to address, the questions: why do we continue to regard what is so clearly an asset as a liability; and what would an appropriate long-term development program look like that could sustainably harness the productive potential of the ASALs and reduce repeated crises? In the next several months, numerous technical and political consultations are planned to discuss short, medium and long-term development in the ASALs. Against this backdrop, and the urgency of tackling this challenge head on, the African Union (AU) through its Interafrican Bureau for Animal Resources (AU-IBAR) convened an expert consultation 2–3 September 2011 in Nairobi, which was hosted by the International Livestock Research Institute (ILRI), a center of the CGIAR Consortium. The consultation brought together over 50 development practitioners, researchers, and policy makers (from non-governmental organizations, government, regional organizations, international research institutes, and development agencies) from the Greater Horn of Africa and globally that are or have been engaged in addressing the challenges to the development of the ASALs. This statement is a summary of key trends identified and recommendations of the experts. It also provides a summary of outcomes, illustrative interventions and issues for consideration. ASALs account for 70% of the land area of the countries in the Greater Horn of Africa. ASALs are a discrete geographic area in the Greater Horn of Africa where the population is vulnerable. The shared agro-ecosystem, including natural resources such as water and pastures and common production systems, offers an opportunity for cooperation among countries to identify and implement solutions. Pastoral and agro-pastoral livestock production systems are the primary economic enterprise and main economic driver in the ASALs. There are now a large number of activities being implemented at country and local levels to help mitigate the impacts of drought and to build household and community resilience in an environment of increasingly unpredictable rainfall. Social, technical and economic services are not widely available, especially to the mobile pastoral populations, and the longer-term development needs of the ASALs are generally neglected. Insecurity in the region exacerbates vulnerability and hinders effective response and other interventions. The region is experiencing an increased number of shocks, especially more frequent droughts and floods, but also man-made shocks. Although the long-term impacts of climate change cannot yet be accurately predicted, there appears to be increased variability of rainfall; and although many experts believe the region will become progressively hotter and drier, some parts may become wetter and more flood-prone. There are growing opportunities for international/regional trade in livestock products due, in large part, to the increased demand for these products in Africa and the Middle East fuelled by growing populations, urbanization and rising incomes. While access to services remains generally poor in the ASALs, significant progress has been made recently through greater access to, and coverage by, mobile phones. Country strategies and investment plans are in place, but ASAL programming, although it is included, is not prioritized, coordinated or well developed. Ongoing processes of land fragmentation, insecure tenure and use rights, and externally driven land appropriation processes also undermine pastoral productivity. Improved research coordination and frameworks are already in place but need to be leveraged to support the ASALs. Policy windows of opportunity are emerging nationally and regionally, and the political voice of pastoralists is increasing. 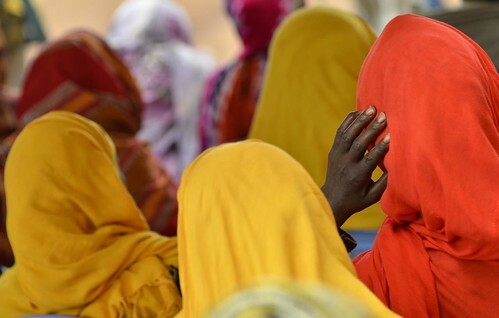 The immediate challenges being faced in the Greater Horn of Africa serve as a call to action that is being heard and responded to by many countries, agencies, and interest groups. The immediate attention to saving lives and protecting livelihoods is indeed critical. However, much of this response, especially the efforts focused on long-term development, could make better use of existing systems, evidence and best practices to inform investment. They are too often partial solutions because no single country or agency has the ability to mobilize the resources or political will to operate at the scale needed to systemically tackle the issues. Recognizing the need for coordinated action, two recommendations are summarized below to advance a more effective mobilization of domestic resources and foreign development assistance in support of a long-term development effort. Analysis to help inform and clarify the expected outcomes and targets from the investment in ASALs on the national agriculture and food security goals and targets, articulated through their CAADP Plans. An inventory and review of ongoing efforts in the ASALs, identify best practices and modalities or instruments to consolidate ongoing efforts, align them with long term goals and targets, and scale up the best practices. Strategic coordination of research and technical support to assist national coalitions of government, development partners, NGOs and the private sector to prioritize various interventions for the ASALs. Development of partnerships to support and implement high-priority policy recommendations, and research, development and economic growth projects and activities. The review of options for establishing an implementation framework at the national and regional levels that provides effective coordination, and that clarifies the roles and responsibilities of various parties in the implementation of a coordinated investment strategy for ASALs. The task force is envisaged as a temporary measure with a lifespan of around 6 months: an important task during this period will be to identify a more sustainable platform to provide ongoing effective coordination to support long-term development of the ASALs of the Greater Horn of Africa. 2. The international community and bilateral development agencies should mobilize a consortium of technical organizations, e.g. CGIAR, FAO, WFP and NGO partners (e.g. REGLAP) to work with and support the AU task force in close consultation with the concerned countries to identify best practice, develop programs, provide technical services and conduct relevant research to support long term development of the ASALs. The expert consultation identified key challenges that a long-term development effort in the ASALs will face, considered major outcomes that will need to be pursued, and began to examine best practices that have been developed and are being applied, typically on a small-scale basis, that could be helpful in the long-term development of the ASALs. The expert consultation considered possible outcomes and actions for long-term agenda from the lens of: a) increasing the contribution of the ASALs to agricultural growth and national development goals and targets; and b) diversifying livelihoods and improving resilience amongst vulnerable households in ASAL areas of the Greater Horn of Africa. Six major outcome areas and related illustrative interventions are considered as key in advancing the long-term development of the ASALs. They include the following. Recognizing the urgency of the situation, it is proposed that the African Union convenes a broadly based task force immediately, drawing on the rich expertise available within the region, continent and globally. At the same time this joint statement should be distributed to other stakeholders, including the donor community, engaged in technical and political consultations over the next few weeks and months, with a view to mobilizing a coordinated effort to shape and implement a long-term development program to tackle the underlying causes of vulnerability in the ASALs of the Greater Horn of Africa. Newly approved CGIAR Research Programs, in partnership with national research institutes and other stakeholders, have the capacity to identify information and knowledge gaps, and provide research and innovation fundamental to the ASALs finding lasting and viable solutions, and to provide improved food security, reduced poverty, enhance nutrition and health, and more sustainable use of natural resources for the Greater Horn of Africa region. ILRI’s Bruce Scott delivers a talk at an expert consultation on livestock systems in the Horn of Africa (photo credit: ILRI/Susan MacMillan). Bruce Scott, acting director general of the International Livestock Research Institute (ILRI), delivered the following talk at the opening of an expert consultation convened by the Africa Union-Interafrican Bureau for Animal Resources (AU-IBAR), on ‘Interventions for sustainable livestock systems in the Horn of Africa’, held at ILRI’s campus in Nairobi, Kenya, on 2 September 2011. ‘I thank you all for accepting the invitation from the Africa Union to attend this expert consultation. ‘I thank the Africa Union Commission (AUC) and AU-IBAR for convening this meeting, which ILRI is pleased to host. ‘I especially appreciate each of you agreeing to attend this meeting at this time of crisis, where there are so many activities competing for your precious time. We are confident that your presence will help us identify steps towards a more holistic and practical approach for addressing livestock issues in the Horn. ‘I am delighted to welcome His Excellency Erasmus Mwancha, deputy chairperson of the Africa Union Commission, who has kindly agreed to officially open this consultation. ‘I also take pleasure in acknowledging the presence of the chief executive officer of the CGIAR Consortium of International Agricultural Research Centers, Lloyd Le Page. Yesterday (Thursday, 1 September), Lloyd convened a CGIAR media briefing and learning event also here at ILRI, and also on the crisis in the Horn, looking at the most promising agricultural research inputs for addressing these issues in future. ‘The consensus of the Consortium’s learning event was that we need greater investment in agricultural development, greater support for agricultural research, and greater cooperation between research, government, private sector and development actors. These can spread the adoption of innovations by farmers and herders, helping millions of food producers in the Horn of Africa, who are now facing the severest drought in this region in the last six decades. ‘The CGIAR and partner experts gathered yesterday called for a ‘matching of investments in infrastructure development with investments in knowledge’ to get more research into use. ‘We are all here at today’s Africa Union meeting because of our commitment to finding sustainable livestock-based solutions for this region’s food production problems. ‘I’d like to take a minute to set some context for this consultation. ‘Rangelands cover about one-half of the landmass in Africa. In Kenya, about 80 per cent of the landmass comprises arid and semi-arid lands. These drylands can be subdivided into the wetter drylands and the drier drylands. Most of the Horn now afflicted by drought is made up of the drier drylands. I caution us to keep in mind that food production options appropriate for the wetter drylands often are inappropriate for the drier drylands. ‘Droughts have frequented the Horn of Africa for centuries. But in recent decades they have become more frequent and the rainfall has become more variable from year to year. Both of these changes are increasing the vulnerability of the communities that live in these lands. ‘As you know, livestock are a central source of livelihoods in this region and the major way that pastoralists generate income and build their ‘asset base’. A remarkable 70 per cent of all the beef produced in Kenya comes from the arid and semi-arid regions of the country. ‘The Horn of Africa experiences bimodal rainfall, which occurs in only a few regions on earth. That means that the little rain that does fall in these drylands does so in two rather than one growing season, which of course reduces the low levels of annual rainfall available for either of the two annual growing seasons. While this is bad news for cropping, it serves animal production particularly well, with pastures renewed twice a year. Furthermore, the unpredictability of rainfall here is often so great as to allow only one crop every third, fourth or fifth season, which makes crop production unviable without irrigation of some sort. ‘Africa’s dry rangelands are, in fact, productive, and potentially very productive. They are good filtres of water, for example, with some parts of the continent’s drylands, such as in West Africa, having sizable aquifers below their surface (these aquifers, unfortunately, are much smaller in the Horn). The drylands are home to much of the continent’s wildlife diversity. The drylands sequester carbon, and carbon credits might one day provide the local populations with new income streams. And livestock enterprises are not only a major source of income for the peoples of the Horn, they also provide up to 50 per cent of the agricultural gross domestic product of these countries. ‘In spite of all this, the Horn’s drylands have been badly neglected. Governments have neither significantly invested in nor developed these drylands, whose people (pastoral livestock herders) have been marginalized for decades. Donor investments in this region have fallen drastically in the recent past and even ILRI has reduced its attention to these drylands since the late 1990s. ‘Meanwhile, over the last 30 years, more and more people and more and more animals have inhabited these fragile ecosystems, fragmenting the rangelands and reducing the mobility of the herders and their stock in seasonal search of new pasture. Pastoral mobility has also been restricted by governance issues, insecurity, and conflicts over natural resources. And as we well know, Somalia has been a non-state since 1990 and many of the region’s commercial livestock markets are functioning badly or not at all. ‘It is clear to us that the traditional way of managing livestock will need to change to adapt to changes in this region and that we’ll need to identify ways to help the Horn’s pastoralists diversify their incomes and livelihoods. ‘ILRI is investigating promising options for this region’s livestock herders, including better land-use policies, well-functioning livestock markets, pastoral livestock insurance and schemes to pay pastoral herders for their environmental services, such as sequestering carbon, filtering water and conserving wildlife. 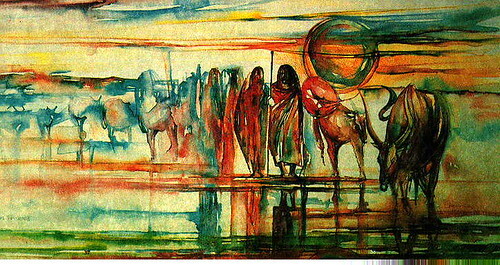 ‘Maasai herding’, painting by Kahare Miano (photo credit: ILRI/Elsworth). A CGIAR news briefing will be held on the food crisis in the Horn of Africa on 1 September 2011 at the campus of the International Livestock Research Institute (ILRI). This event will be broadcasted live on our Horn of Africa page. INVITATIONS: The briefing is open to the press and the public, but RSVP is needed to get access to the ILRI compound (see below). The current famine engulfing the Horn of Africa and threatening the lives of nearly 13 million people continues to dominate discussions about development worldwide. As relief efforts continue, experts and stakeholders from the region will gather in Nairobi to discuss longer-term evidence-based solutions and interventions needed to avert the profound effects of predicted extreme weather events in the future. Although droughts can result in failed harvests, they do not have to result in famine. Famine mainly has to do with inappropriate policies, conflicts and neglect, which reduce people’s access to food, grazing for livestock, and water for both. We must support agencies delivering emergency aid today. And we must do more. Almost everyone living in the drought-afflicted areas of the Horn produces food from these drylands. Research into dryland agricultural and natural resources thus plays a critical role in uncovering the causes of food shortages and identifying ways of reducing these. Linking smallholder farmers and herders with research knowledge, products and innovations—from better uses of land, water and other natural resources, to better grazing and pasture management, to weather-based insurance that protects against drought and other shocks, to drought-tolerant crops—could greatly enhance the resilience of vulnerable dryland communities to future droughts. Experts within the Consultative Group on International Agricultural Research (CGIAR) will meet in Nairobi on 1 September with a few selected development partners to discuss how CGIAR research can be used to find long-term solutions to improving and sustaining agricultural livelihoods in the drylands. The briefing is open to the press and to the public. 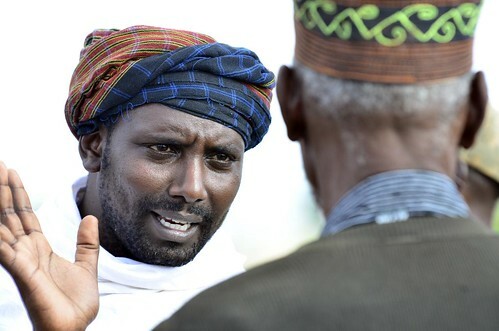 ILRI scientist Andrew Mude leads a project introducing insurance to the pastoralist communities of Kenya’s remote northern Marsabit District, which is also where Mude is originally from (photo credit: ILRI). Last night (24 Aug 2011), ABN’s South African correspondent Lerato Mbele interviewed Andrew Mude, leader of an Index-Based Livestock Insurance Project at the International Livestock Research Institute (ILRI) in Kenya. 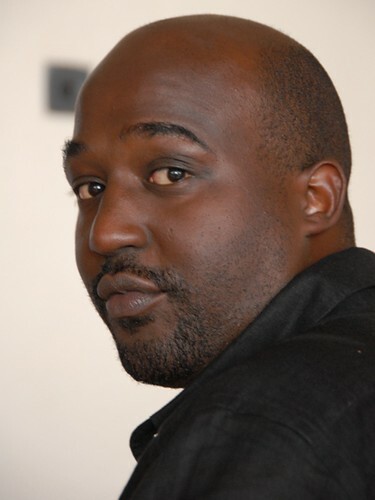 Before Mude went to the studio in Nairobi to do this live television news interview, he sat down with ILRI staff to prepare what he wanted to say. Here’s a summary of what he had on his mind. Kenya’s drylands are big; they make up 80 per cent of the Kenya’s total area, in which some 10 million people raise 70 per cent of the country’s livestock. The value of the pastoral livestock sector, which includes meat, milk, and other products from these animals, is estimated to be worth US$800 million annually. And roughly 90 per cent of the meat consumed in East Africa comes from pastoral herds. Research confirms that the pastoral livestock sector is not only productive and critical to Kenya’s food security, but also an optimal way to manage and maintain drylands and the livelihoods of those who live off them. At a time when the government and donors are looking for long-term solutions to addressing food security, our research suggests that herding makes better economic sense than crop agriculture in many of these arid and semi-arid lands. Supporting semi-nomadic livestock herding communities with timely interventions before a crisis hits can help people cope the next time drought threatens. Recommending that livestock herders switch to farming crops is simply unrealistic for most of the people inhabiting this region’s great drylands; building vast irrigation systems here is simply not feasible in both economic and ecological terms. Droughts have always been part of life for people in drylands but these droughts are now coming more frequently and affecting many more people across rangelands that are becoming more and more fragmented. Farmers and livestock herders need options and support to cope with recurring drought, particularly in the face of other kinds of climate change. Luckily, options exist. For example, my organization, ILRI, based here in Nairobi, is working with UAP Insurance, Equity Bank, and SwissRE to roll out an insurance program for several thousand livestock keepers in Marsabit District to protect them against drought. Standard types of insurance are not feasible for remote livestock herders such as those in Marsabit, where throngs of officials would be needed to verify livestock deaths before insurance companies would make pay outs to the insured. So we came up with a model that makes use of satellite data showing the state of a region’s vegetation. When the satellite data show that the available forage drops below a given threshold, where one would expect most livestock to perish, all insurance policyholders are paid, whether or not their animals died. With tweaking to cater for various local conditions and lots of training to educate communities that have never before had insurance schemes available to them, these kinds of programs could be extended across the drylands of Africa. Watch this 7-minute television news interview of ILRI’s Mude, who argues that pastoralism is a system that evolved to take advantage of arid and semi-arid lands, such as those suffering drought now in the Horn of Africa: CNBC Africa: Investing in pastoralism with Andrew Mude, 24 Aug 2011. 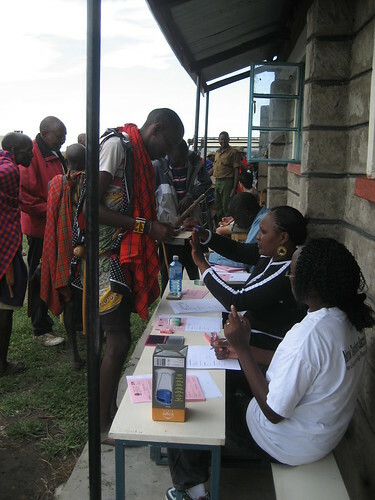 Maasai pastoral herders signing up to the Naboisho Conservancy in Mara area in 2010. Ecosystem conservation schemes are giving herders new sources of income (photo credit: ILRI/Bedelian). Biodiversity conservation among pastoral communities is increasingly researched as an area that could hold the key to helping pastoralists deal with the challenges of climate change and land use policy changes by allowing them to diversify their incomes. In Kenya the use of payments for ecosystem services, mostly around the country’s reserves and parks—where people live close to wildlife—is providing a stable, reliable and predicable source of income to pastoralists with the double advantage of reducing poverty and protecting wildlife. In many sites where payments for ecosystem services have be piloted successfully, local-level institutions have played a significant role in enabling communities to self-govern and are supported by flexible land-use and governance systems that respect the communal land ownership patterns that have traditionally existed in these areas. Payments to livestock herders for the ecosystem services generated through their land uses are currently being made in lands adjacent to Kenya’s famous Masai Mara National Reserve, in the southwest of the country, and in the Kitengela wildlife dispersal area to the south of Nairobi National Park. In both areas, Maasai people have formed ‘eco-conservancies’ to protect their grazing areas for livestock and wildlife alike. ‘Findings from on-going research show that in 2009 in the Kitengela area, ecosystems payment schemes were providing a large amount of income that constituted 59 per cent of the total off-farm earnings among participating households, even though livestock keeping is still the largest and most important source of income for these pastoralists,’ said Philip Osano a student at McGill University who is affiliated to the International Livestock Research Institute (ILRI) and is evaluating the effects of payments for ecosystems services on poverty reduction among pastoral communities in Kenyan rangelands. Scientists at ILRI, headquartered in Nairobi, Kenya, are investigating these hard trade offs to ensure that the benefits of such interventions are more equitable among members of the pastoral communities inhabiting these wildlife-rich areas. 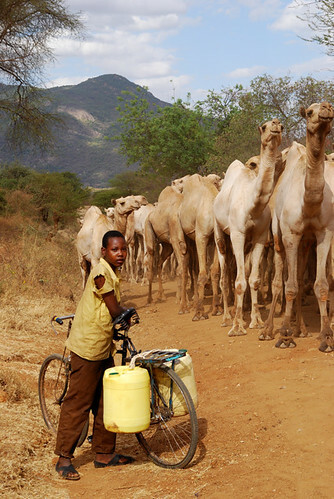 Camels walk from Somalia to Nairobi, Kenya (photo on Flickr by Matteo Angelino). As hunger spreads among more than 12 million people in the Horn of Africa, a study by the International Livestock Research Institute (ILRI) of the response to Kenya’s last devastating drought, in 2008–2009, finds that investments aimed at increasing the mobility of livestock herders—a way of life often viewed as ‘backward’ despite being one of the most economical and productive uses of Kenya’s drylands—could be key to averting future food crises in arid lands. The report, An Assessment of the Response to the 2008–2009 Drought in Kenya, suggests that herding makes better economic sense than crop agriculture in many of the arid and semi-arid lands that constitute 80 per cent of the Horn of Africa, and supporting mobile livestock herding communities in advance and with timely interventions can help people cope the next time drought threatens. The authors say that recommending that most livestock herders switch to farming crops or move to cities is simply unrealistic in this region’s great drylands, which will not support row crops without extensive irrigation, which is scarce and often impractical. An estimated 70 million people live in these drylands, and many of them are herders. In Kenya, the value of the pastoral livestock sector is estimated to be worth USD800 million. And the Intergovernmental Authority on Development in Eastern Africa, which takes a regional approach to combating drought in six countries of the Horn, estimates that over 90 per cent of the meat consumed in East Africa comes from pastoral herds. The best way to prevent famine in arid lands is to ensure herder access to critical dry-season grazing and watering areas. All the herders interviewed in this research assessment reported that obstacles to the movement of their herds—caused by lack of roads, land conflicts and demographic pressures—constituted the largest problem they had in protecting their animals and livelihoods. Thus, the ILRI study findings reinforce what others have found—that migratory herding is the most productive use of much of this land. A second major problem was a dearth of functioning commercial livestock markets. Destocking—where herders sell off those animals they can no longer feed or water to the government—does not work where there are no dynamic livestock markets. Thus, during droughts, it is more helpful for local government agencies to organize the slaughter of excess cattle on site—paying herders for the fresh meat, and giving the meat to the local herding communities to consume—than it is to ship large amounts of hay or other fodder to drought-struck areas, or to try to transport cattle out of such areas. In general, the ILRI report found that the response to the 2008–2009 drought, while better than that for a major drought a decade earlier, was still too little, too late. The report was funded by the European Union to help Kenya improve its drought management system. Since 1996, with support from the World Bank and the European Union, the country has been moving to improve drought management through a national arid lands management program. 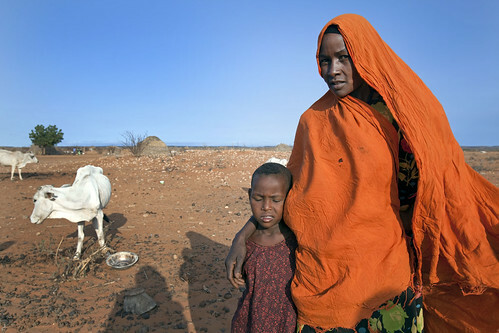 Still, the 2008–2009 drought was devastating; more than half of all livestock died in many districts. The loss of livestock assets in successive droughts has had the effect of steadily impoverishing many herders in Kenya and other countries of the Horn of Africa. Such ecosystem protection efforts are going on in the Masai Mara region of southern Kenya and in the Kitengela rangelands near Nairobi, where Maasai people have formed ‘eco-conservancies’ to protect their grazing areas for livestock and wildlife alike. Read more about the ILRI drought assessment on the ILRI News Blog: Best ways to manage responses to recurring drought in East Africa’s drylands, 7 Aug 2011. ILRI researcher holds discussions with local pastoral herders in Marsabit, in Kenya’s northern drylands, for ILRI’s Index-based Livestock Insurance project (photo credit: ILRI/Mude). SciDevNet reports that, due to the great drought engulfing the Horn of Africa, an ‘index-based’ livestock insurance scheme for herders in Kenya’s remote Marsabit District may make payments to those who had earlier purchased the insurance. This is the first time insurance has ever been offered Kenya’s remote livestock herders, and these would be the first payments for those who have insured their stock. What is ‘index-based’ livestock insurance? Index-based livestock insurance makes the risk-management benefits of insurance available to poor and remote clients. 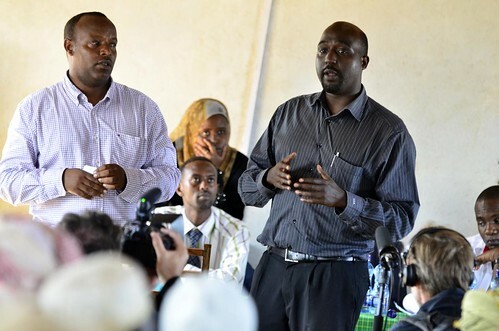 The product being piloted in Marsabit District by the International Livestock Research Institute (ILRI) and other partners, including the private sector, aims to provide compensation to insured pastoralists in the event of livestock losses due to severe forage scarcity. Incorporating remotely-sensed vegetation data in its design, delivered via mobile ICT-based transactions platforms, and with experimental extension methods used to educate the remote pastoral herders, this insurance product boasts many firsts in product development. Payments are triggered when severe drought makes forage scarce over a long period and when it can be predicted from that that more than 15 per cent of livestock in the area will have died of starvation. ‘Insurers will assess in October whether Kenyan farmers signed up to the Index-Based Livestock Insurance scheme will receive their first payment, after the worst drought in the region for 60 years. ‘The scheme, which has been piloted in northern Kenya since early 2010, uses freely-available satellite data to assess the state of pastures. When the images show that pastures have dried up, farmers can claim compensation for animals that have died as a result—without insurers having to verify the deaths in person. ‘In Kenya about 2,500 farmers have purchased the product since its inception, paying a yearly premium of up to US$100 for 6–8 animals. . . .
‘”So far, the predicted mortality [rate is] high—but we have to wait for the final tally at the end of October in order to determine whether or not there will be a payout,” said Brenda Wandera, project development manager at the International Livestock Research Institute (ILRI), Kenya, which implemented the scheme. 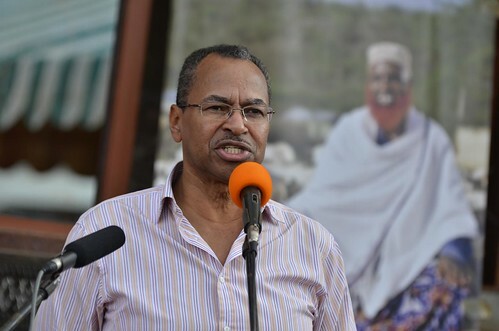 ‘The scheme will be extended to southern Ethiopia in February 2012 to help mitigate the effects of drought. It will initially target 2,700 pastoralists. Read the whole article at SciDevNet: Kenyan farmers may soon receive first drought payout, 15 Aug 2011. For more information, visit the blog of ILRI’s Index-Based Livestock Insurance project. ILRI-duckrabbit photofilm on the impacts of a 2009 drought in Kenya on Maasai children in the Kitengela rangelands, outside Nairobi (website image credit: duckrabbit). What’s it like for a pastoral family in Africa to lose all their animals? What will the livestock peoples of the Horn do in the aftermath of this year’s devastating drought, which is sending so many into poverty? We can get a glimpse from this 2-minute photofilm/photo-testimony of Ann Aiyaki, an adolescent Maasai schoolgirl whose family fled to Kitengela in 2009, and whose life changed when the rains failed and the animals died. Similar to so many tens of thousands of Somali herding families on the march today in search of food and refuge from the ongoing drought in the Horn of Africa, many of Kenya’s pastoralists in a great, previous, drought of 2009 were forced to move. 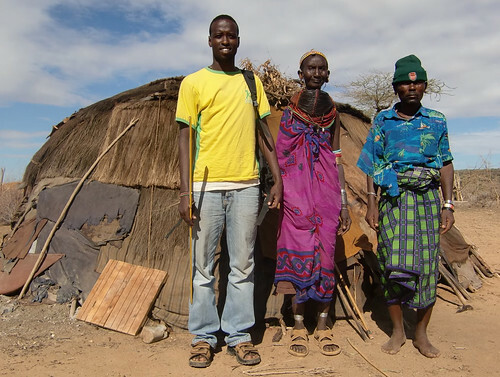 We met Ann Aiyaki and her family in the Kitengela Maasai rangelands just outside of Nairobi. This is her story of how the drought affected her life. This photofilm was produced during a week-long photofilm training course led by duckrabbit’s Benjamin Chesterton and David White at the International Livestock Research Institute (ILRI), in Nairobi, Kenya. The audio and production was led by ILRI staff Muthoni Njiru, Julius Nyangaga and Tezira Lore. The photos are by ILRI’s Muthoni Njiru, Julius Nyangaga and Tezira Lore and duckrabbit photographer David White. With special thanks to David Chesterton for his passion and talent in helping ILRI conceptualize, make and finalize this film, and to David White for his extraordinary photographic generosity. We thank both for their uncommon ability to give others confidence in using their talents to make a bigger difference. 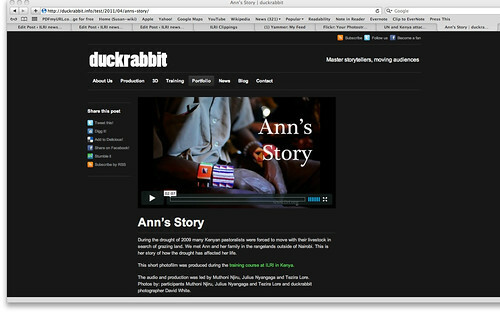 Duckrabbit is an award-winning digital production company that in documentary audio, still photography and video to make compelling film and audio narratives for commercial, charity and broadcast clients. They also train photographers, videographers, journalists and communications professionals in audio-visual storytelling and online strategic communications. 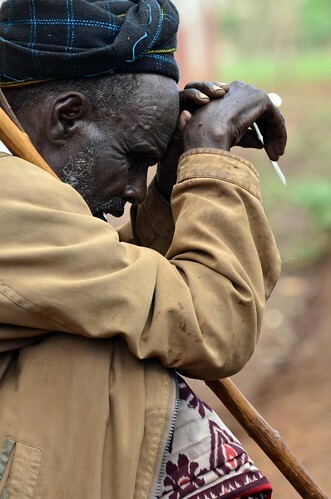 Peter Little, co-author of the timely new publication, Risk and Social Change in an African Rural Economy: Livelihoods in Pastoralist Communities, and leader of a recent review of ILRI’s pastoral research (photo credit: Emory University). Risk and Social Change in an African Rural Economy: Livelihoods in Pastoralist Communities is a new book published by research partners John McPeak and Peter Little, of a Livestock-Climate Change initiative of the Collaborative Research Support Program (Livestock-CC-CRSP). The book summarizes the results of a multi-year interdisciplinary research project in pastoral areas of Kenya and Ethiopia. The authors describe the ecology and social context in which pastoralism takes place, with a particular focus on the risks that confront people living in these drylands, and how these risks are often triggered by highly variable rainfall conditions, a symptom of climate change. The authors go on to describe the livelihood strategies employed by pastoralists in these areas, with a focus on how well-being is tied to access to livestock and the cash economy. They conclude that the future development activities need to be built on the foundation of the livestock economy, instead of seeking to replace it. 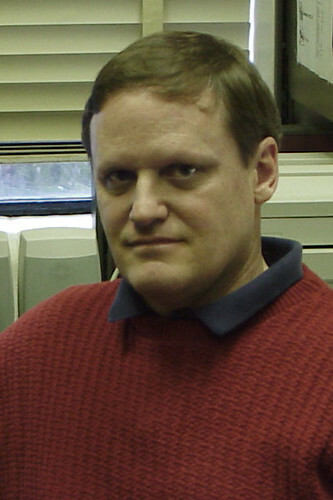 John McPeak is an associate professor and vice-chair in the Department of Public Administration in the Maxwell School of Syracuse University; he is a member of a Livestock-CC-CRSP project in Mali and leads another project in Senegal. Peter Little is professor of anthropology and director of a Program in Development Studies at Emory University and leads a Livestock-CC-CRSP project in Ethiopia and Kenya. This project is known as CHAINS, which stands for ‘Climate variability, pastoralism, and commodity chains in Ethiopia and Kenya.’ The CRSP initiatives are funded by the United States Agency for International Development. The following is a description of the book from Routledge. ‘Pastoralists’ role in contemporary Africa typically goes underappreciated and misunderstood by development agencies, external observers, and policymakers. Yet arid and semi-arid lands, which are used predominantly for extensive livestock grazing, comprise nearly half of the continent’s land mass, while a substantial proportion of national economies are based on pastoralist activities. ‘Pastoralists use these drylands to generate income for themselves through the use of livestock and for the coffers of national trade and revenue agencies. They are frequently among the continent’s most contested and lawless regions, providing sanctuary to armed rebel groups and exposing residents to widespread insecurity and destructive violence. The continent’s millions of pastoralists thus inhabit some of Africa’s harshest and most remote, but also most ecologically, economically, and politically important regions. ‘This study summarizes the findings of a multi-year interdisciplinary research project in pastoral areas of Kenya and Ethiopia. The cultures and ecology of these areas are described, with a particular focus on the myriad risks that confront people living in these drylands, and how these risks are often triggered by highly variable rainfall conditions. The authors examine the markets used by residents of these areas to sell livestock and livestock products and purchase consumer goods before turning to an analysis of evolving livelihood strategies. Furthermore, they focus on how well-being is conditioned upon access to livestock and access to the cash economy, gender patterns within households and the history of development activities in the area. The book concludes with a report on how these activities are assessed by people in the area and what activities they prioritize for the future. Get the book—Risk and Social Change in an African Rural Economy: Livelihoods in Pastoralist Communities, by John G McPeak, Peter D Little, Cheryl R Doss, published 28 Jul 2011, by Routledge, 206 pages—from Routledge online.